What Is It? This 1970 British produced television series from Gerry Anderson (best known for his Supermarionation shows like Thunderbirds as well as the cult sci fi series Space: 1999) brought us a covert war between a secret organization known as SHADO (Supreme Headquarters Alien Defense Organization) and an alien race from a dying planet. Why It Stands Out: Because the show managed to buck its potentially formulaic premise and deliver some hard-hitting, intelligent science fiction drama with mature themes. Is It Must-Watch Sci Fi? I believe so. The show is definitely dated and delivers plenty of cringe-worthy 70’s cheesiness, but it also delivered some damn good sci fi episodes. The Skinny: Sure, many may consider this a relic of its time because the look and feel of the show has not dated very well. Prepare yourself for cheesy (though good for their time) special effects, outlandish costumes, laughable 70’s music, corny dialog, and exceptionally wooden acting. If you can get past these, however, you will find that this is a real sci fi sleeper. The premise could have resulted in alien-attack-of-the-week episodes (which it did deliver to some extent), but the scripts extended beyond that and made attempts to explore how this covert war affected the lives of the SHADO officers as well as those unwittingly caught up in its events. As outlandish as the series was, the writers often tried to focus on the realistic consequences of the stories and often the episodes had unexpected, downbeat endings, something eschewed by Prime Time television even today. The series was much more adult in tone than Anderson’s prior kid-friendly Supermarionation shows and more down to earth than his later series Space: 1999 which all too often grasped at (and fell short of) profundity. Present day viewers watching UFO for the first time may find it a bit inaccessible to start with because it is so dated. But if you stick with it, you will find some good science fiction tales in this rare gem of a show. Cancelled Too Soon? Yes. A second season of the show was originally commissioned, though it would have moved most of the action to the moonbase (because the moon-focused episodes tended to be more popular) and the title would have been changed to UFO: 1999. However, ratings declined during the second half of the show’s syndication run and ITV (who produced the series) changed their mind about the second season. Anderson tinkered with the concept, though, and it eventually morphed into a completely different series: Space: 1999. Revival: In the 1990’s and 2000’s, there were talks about a television revival of the show, but nothing substantial ever came of that. A May 2009 announcement from ITV claimed that a big screen version was in the works with Fringe‘s Joshua Jackson pegged to play Paul Foster and Heroes alum Ali Larter in talks to appear as Colonel Virginia Lake. A website for the movie was set up, but little more has been heard about it since 2012. Should It Be Rebooted? Yes. The concept lends itself well to a reboot and is a flexible enough that it could be reworked several ways. It could be a continuation of the original, just fifty years later. Or it could just reboot the premise and start over (it would be great if it remained in its original 70’s setting, though). Most importantly, any good reboot would have to follow the tone of the original and include the moral quandaries and consequences of war that made the 70’s series rather edgy for its time. Interesting Fact: The SHADO secret base was set beneath a movie studio and there was a specific reason for that. It was never addressed in the series, but in one of the novelizations the reason given is that large pieces of unusual looking equipment and/or vehicles could be explained away as movie props. Where Can You Watch It? The entire series has been released on DVD, though it is out of print and price is sky-high. It is available for streaming on the free service (with adds) Tubi TV and it is definitely worth checking out for some retro-sci fi that rises above expectations. 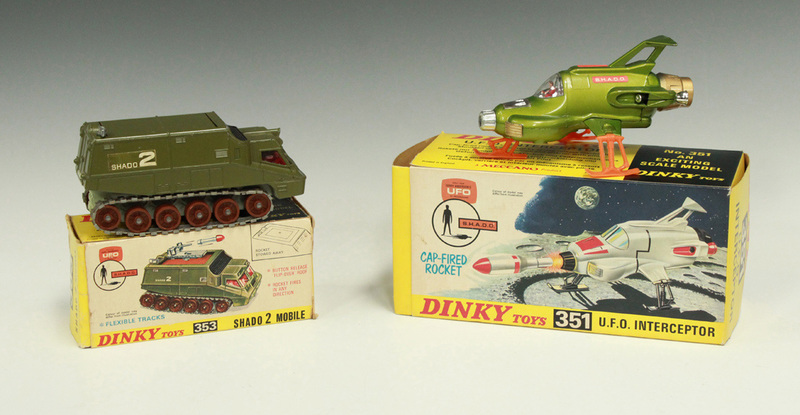 Retro Toys: Back in the 1970’s, Dinky Toys made die-cast versions of the SHADO Interceptor and the Mobile Unit. In the days before video games, the internet, and texting, these provided hours of entertainment to many kids who still knew how to play with toys!